So what’s your favorite holiday meal? Do you go with something traditional like turkey, dressing, sweet potato casserole and pumpkin pie? Or do you look for something totally different like standing rib roast, stuffed russet potatoes, fried apple pies? What ever it is, by now your mouth is watering and you can almost smell the turkey. Well if you decide to go traditional this year, don’t forget the Traminette wine. 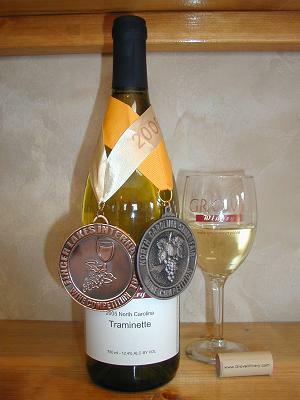 For those of you that have never had the pleasure, Traminette is a relative of Gewurtzminer but with less residual sugar. It comes in two versions: Halbtorocken (literally, translated as half dry) and Trocken, the sweeter version (derived from longer fermentation). These two wines can carry your whole holiday meal from appetizers to dessert. Some of the best Traminette in North Carolina is made by Max Lloyd at Grove Winery. The Halbtorocken version pairs especially well with turkey but is also going to pair well with spicy foods such as ham or a cranberry salad and would be perfect for brunch along side country ham and biscuit. 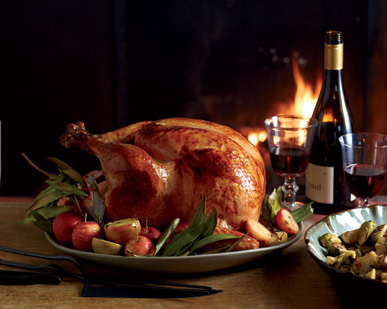 TIP: Per the November, 2011 issue of Food and Wine Magazine, Chef Michael Symon keeps turkey moist in the oven by covering it with butter and cider-soaked cheesecloth. Grove Winery , voted “Best Vineyard in the Triad,” is releasing both versions of their 2010 Traminette November 18 and you are really in luck, you can stock up for the holidays at a 20% discount from the 18th through the 23rd.